Back cover blurb: Margot Lewis is the agony aunt for The Cambridge Examiner. Her advice column, Dear Amy, gets all kinds of letters - but none like the one she's just received: 'Dear Amy, I don't know where I am. I've been kidnapped and am being held prisoner by a strange man. I'm afraid he'll kill me. Please help me soon, Bethan Avery'. Bethan Avery has been missing for years. This is surely some cruel hoax. But, as more letters arrive, they contain information that was never made public. How is this happening? Answering this question will cost Margot everything. 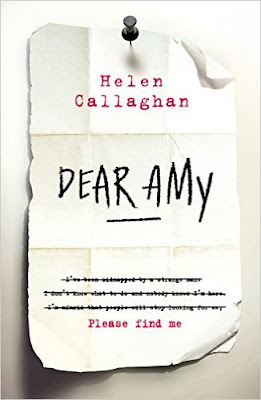 Dear Amy is Helen Callaghan's much anticipated debut novel, and whilst it has most of the elements needed for a great psychological thriller, I just couldn't help but feel like there was something missing. Margot Lewis is a teacher at a local school when one of her pupils Katie Browne goes missing. Soon after Katie's disappearance, Margot, who is also an agony aunt at the local newspaper begins to receive letters begging for help from Bethan Avery. Bethan Avery has been missing for years, presumed dead. Shaken, Margot takes the letters to the local police who think it's probably 'just' a hoax. After all, Bethan Avery is dead. Isn't she? Margot takes it upon herself to investigate with or without Police help. She wouldn't be able to live with herself if Bethan was alive after all this time and she had ignored her. And maybe, just maybe, it will help in the search for Katie Browne. This novel started off with such promise! It's beginning was full of fast paced chapters that had me gripped, then it slowed down towards the middle (where I was confused for a while) and then sped up again at the end. An ending that sadly for me was a bit of an anticlimax. As an avid reader of psychological thrillers sadly Dear Amy wasn't a dazzling debut for me. But I would be interested in reading future works by this author as I did like the writing style. Dear Amy is available from 16 June 2016. You can pre-order it now via Amazon online and Michael Joseph.